*In the event of inclimate weather, the MEP Announcement will be held at the Central Christian Church and the Walking Tour will be cancelled. All venues are within reasonable walking distance of one another. The Walking Tour will lead guests from the Central Christian Church to the State Theater. Parking lots are highlighted in blue. 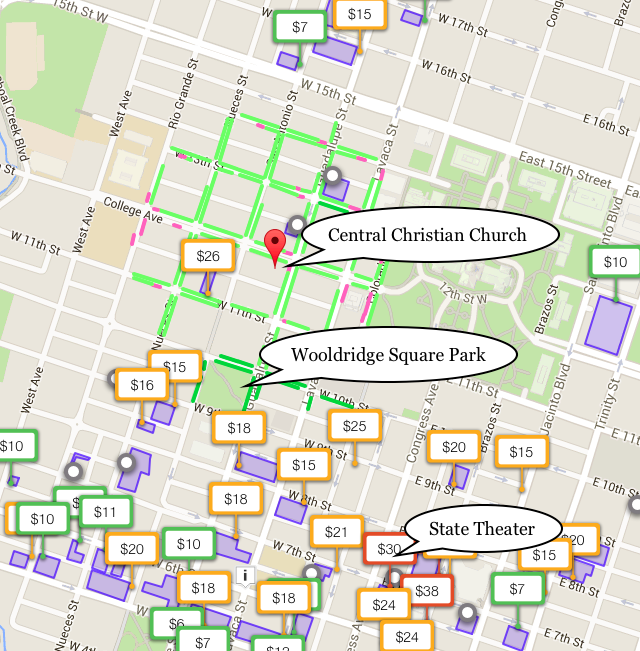 The figures posted represent the All-Day parking fees at various nearby lots. Street parking is highlighted in green. Parking is limited. Please plan accordingly. There is no designated lodging for this event. Austin has a variety of lodging options, including many within walking distance of the event venues. If you have any questions or need assistance booking a room, please contact Paul Cato at 512-472-0102 or cato@preservationtexas.org.